The 6th graders, the nasty little pests, the little annoying brats, they are the bottom. The scum at the bottom of the Middle School Melting Pot. Whatever you call them, they are universally hated by all but their very own. But why? Why are 6th grades hated so much? Their height? Their pubescent voices? Just what is it that makes them so annoying? And should older students respect, instead of bully, the little twerps? 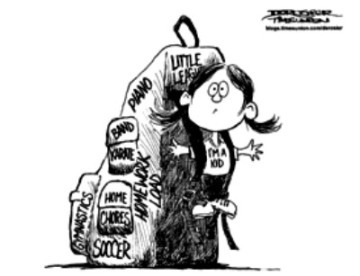 Editorial: Is Today’s Generation Overscheduled and Overstressed? Most students at GFS will admit to being a victim of overscheduling. This phenomenon is making its way into lots of middle schoolers’ lives and is resulting in sleep deprivation and stress, which are two things that shouldn’t be a major part of middle school students’ life. Our schedules are seeming to take over our brains, on some days making us completely dysfunctional without three cups of coffee. Why is rushing from place to place, having hours of homework, playing two sports, three instruments and still keeping up with your Instagram account now the norm?